Skyhawks + ShortGolf Partnership | Post on Youth Sports. 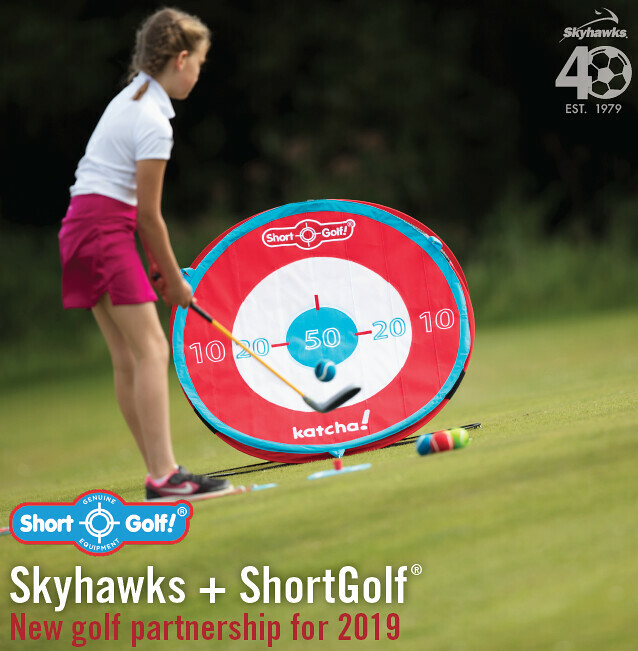 Skyhawks Sports Academy is proud to announce that we have partnered up with ShortGolf®, an innovative learning system designed to make golf easier and more fun to play. ShortGolf was created in 2010 by golf professionals trying to find the best way to play, learn and teach golf, and it has grown into the nation’s preferred entry-level training system for the sport. An officially licensed product of the PGA Tour, ShortGolf is used by some of the best golf organizations across the country, such as The First Tee, the LPGA Foundation and PGA Sections. Perfectly tailored for children, Skyhawks’ participants will love using ShortGolf’s colorful and exciting equipment. In addition, ShortGolf can be played on any surface with minimal space required, making it the simple choice for teaching children golf indoors or outdoors. ShortGolf is a perfect fit for Skyhawks programs because it will teach children how to play golf in an encouraging environment where they will learn important life skills, such as interacting with others. Through working with ShortGolf, Skyhawks will properly teach the fundamentals of putting, pitching, chipping and full shot quickly and effectively in a fun and safe way. To learn more about ShortGolf®, visit out Short-Golf.com. < Skyhawks Ranks #117 in Entrepreneur Magazine’s 2019 Fastest-Growing Franchises!